Portrait of the poet Emily Dickinson at the age of sixteen. Property of Amherst College. For years, scholars have had only one image of the enigmatic Emily Dickinson to go by–that of the poet as a sixteen year-old, taken in 1847 (above). In that time, observers have been unable to help themselves from forming certain ideas of the poet, given this picture of a heavy-lidded, pale, and fragile looking adolescent, coupled with her well-known depressive nature. However, it seems that a new discovery may serve to change our views. That is, if the photograph below is truly the second portrait of Emily Dickinson known to date. 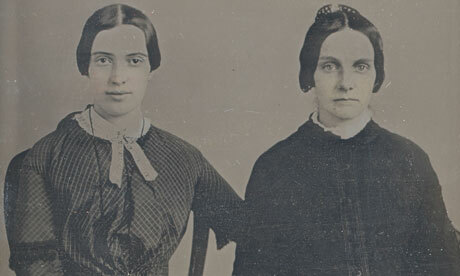 Could the woman on the left be Emily Dickinson, twelve years on from her famous daguerrotype above? The two women have the same eye opening size with the right eye opening being slightly larger than the left. The left lower lid in both women sits lower than the right lower lid… The right earlobe is higher on both women. The inferonasal corneal light reflex suggests corneal curvature similarity, allowing us to speculate about similar astigmatism in the two women. Both women have a central hair cowlick. Finally, both women have a more prominent left nasolabial fold… After a thorough examination of both of these women’s facial features as viewed from the 1847 and 1859 daguerreotypes, I believe strongly that these are the same people. And she’s not the only one. Others at Amherst College, after comparing the fabric of the subject’s dress to swatches belonging to the Emily Dickinson Museum’s textile collection, feel strongly that she must be the famous poet. But what exactly is the significance of finding a second portrait of Emily Dickinson, you may ask? It’s all in our perceptions of her. Reducing our image of her to a photograph of a waifish teenage girl, we’ve been short-sighted in our considerations of Dickinson as a grown woman. It seems impossible to believe that she could be so composed–strong, even–as we imagine her now, extending a protective arm to her far meeker looking friend. 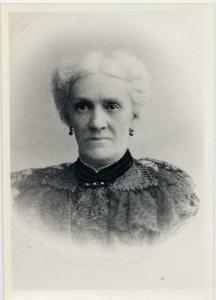 If the daguerreotype is eventually accepted as Dickinson, it will change our idea of her, providing a view of the poet as a mature woman showing striking presence, strength, and serenity. She (whoever she is) seems to be the one in charge here, the one who decided that on a certain day in a certain year, she and her friend would have their likenesses preserved. In fact, even if this photograph is not of Dickinson and Turner, it has still been of use in forcing us to imagine Dickinson as an adult, past the age of the ethereal-looking 16-year-old we have known for so many years. Tell us your views: is the image above, in your opinion, of Emily Dickinson? If so, does it change your perception of her? Leave us a comment below.